It was the summer of 1943, World War II was at its height and families drawn to Rockford for war-related factory work needed housing. In Rockford, the government provided affordable housing at the corner of Harrison Avenue and 20th Street called the Victory Homes. It was to this new development that God called two men from First Evangelical Free Church, Rev. Elmer Johnson and Gunnar Johnson, to conduct tent revival meetings to reach these young families with the Gospel. By fall the two began conducting Sunday school in the administration building at the Victory Homes. For almost ten years, these faithful servants continued to teach and reach people for the Lord. Land was donated around Pershing Road and 16th Street, known as Silver Hill, for a church to be built. The congregation of First Evangelical Free Church voted to build a chapel on this site. Construction began in Spring 1953, with much of the labor being donated by the men from First Free. By November the building was ready for services. In December Don Larson was installed as the first pastor of the new Silver Hill Evangelical Free Church. In 1973 this small but faithful congregation faced a challenge. The neighborhood had changed, and the people moving in were already established in their own churches and showed little interest in this twenty-year old church. A decision needed to be made on whether or not to merge with Alpine Evangelical Free Church, located on East State Street just east of Alpine Road, or perhaps just close the doors and send everyone on their way to find another church in which to worship. God was still at work in the lives of these 50 or so believers. Don Wernberg stepped forward and offered the church five acres of land in southeast Rockford. They sold the church building in preparation for the new site. In the interim, the church rented the Howard Johnson Convention Center for Sunday school and worship. On Palm Sunday of 1975, the first service of the Maywood Evangelical Free Church was held at the new 3621 Samuelson Road site. In 1979, the now expanding church began another building program to include additional Christian education (C. E.) space and a full junior high size gymnasium. On August 3, 1983 Pastor Scott Nesse began his ministry as Senior Pastor, and the attendance, as well as the attendees, once again began to grow. Land was purchased in 1988, and plans were approved for a 10,000 square foot addition to include a new sanctuary and Christian education space. Ground was broken on June 3, 1990, with construction beginning in August. On August 14, 1994 services were held in the completed 475-seat sanctuary. The church broke ground for the new worship center in 2007 to meet the growing needs of our congregation. The building is dedicated in honor of Lance Corporal Andrew G. Patten, who heroically gave his life on the battlefield while serving in the U.S. Marine Corps in Fallujah, Iraq on December 1, 2005. The facility is a multipurpose building designed to incorporate various activities and events such as concerts, leadership conferences, training seminars, athletic events and weekly worship services. 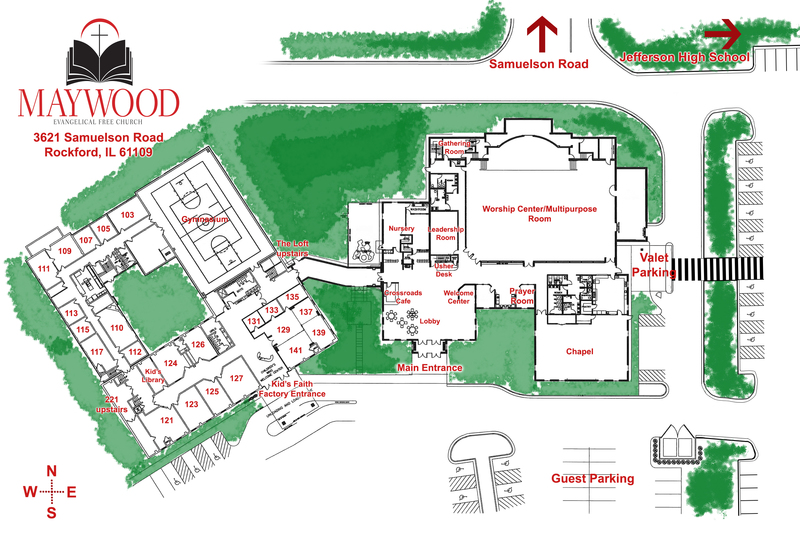 The completion of this building created a whole new dimension of ministry for Maywood in the twenty-first century. During its construction the congregation called Dr. John Strubhar as the new Lead Pastor who served to define the vision for the new facility . He began his ministry at Maywood on Easter Sunday, April 4, 2010 and we held our first worship services in the completed worship center on October 20th, 2013. Early June of 2014, Pastor John announced his retirement that would take place later that year to move to Phoenix, Arizona in order to enjoy the upcoming years with family and to complete some writing projects that he had already started. A search team was established immediately in order to pass the baton as seamlessly as possible to the next pastor. Three months into the search process the search team for lead pastor unanimously recommended Pastor Gary Kniseley (currently serving as our Executive Pastor) as the man they believed God would have to lead Maywood into the next chapter of Maywood’s history. Upon voting and extending a call to Pastor Gary to be our next Lead Pastor he accepted and began his new role on November 1st, 2014. Pastor Gary has already served Maywood for ten years in various capacities and he has worked to develop ministries along with leadership. Under Pastor Gary’s leadership the church has defined its vision statement of "Becoming a People to Reach People for Christ." Pastor Gary is working to optimize our outreach through each existing ministry and is prayerfully seeking ways to advance the Gospel Message through church planting and new outward focused ministries. We rejoice as souls are coming to know Christ as Savior and believers continue to grow in their faith in Christ.